Up till now, I still have no idea why. But, I sure have started to like cheesecake, bit by bit. It started a few years back, when I tasted a small slice of my friend’s no-bake cheesecake. It has a base of digestive biscuits, with fresh fruits layered on top of the biscuit base and having the cream cheese mixture poured over and then refrigerated. I went for seconds, and then thirds, and then the next, and the next… and then you know the end of the story. Well I didn’t immediately fall head and heels in love with cheesecake since that moment, but it did struck me that I didn’t know that cheesecake can taste so light. I’m not sure how a traditional cheesecake should be like. Should it be cheesy, creamy and heavy? With the heavy cheese taste lingering after each mouthful? Or should it be light and delicate, non-overpowering so you can have slice after slice? I guess it all depends! 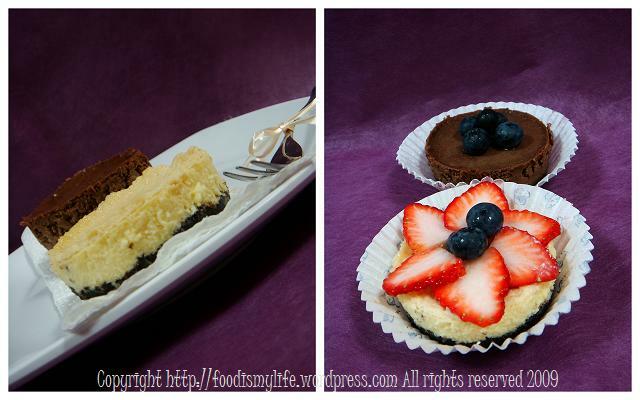 (: Some like it so rich and heavy but some like it light and delicate, as if you’re not eating a cheesecake. 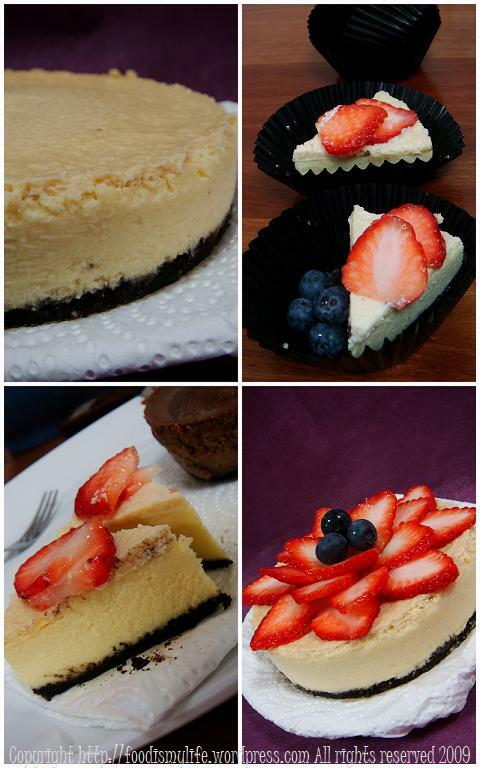 As for me, I’m trying to eat more cheesecakes to have a feel of how a true, real cheesecake should be like. The cheesecake recipe that I’ve gotten is from Nigella. I have not gotten around making cheesecake until now because firstly, I wasn’t a big fan of it last time, and secondly, it looked too tedious to be made. But I was proven wrong by Nigella’s recipe. It was easy and it was fun: processing the oreo cookies, mixing in the melted butter, layering it into the tins and ramekins, making the cheesecake batter, pouring it into the tin and then baking it in a water bath. Well, of course every journey will have its own obstacles and difficulties. I’ll just be posting the original recipes and then state some adaptations/changes that one can make (= Hope you will enjoy making these cheesecakes as much as I do! 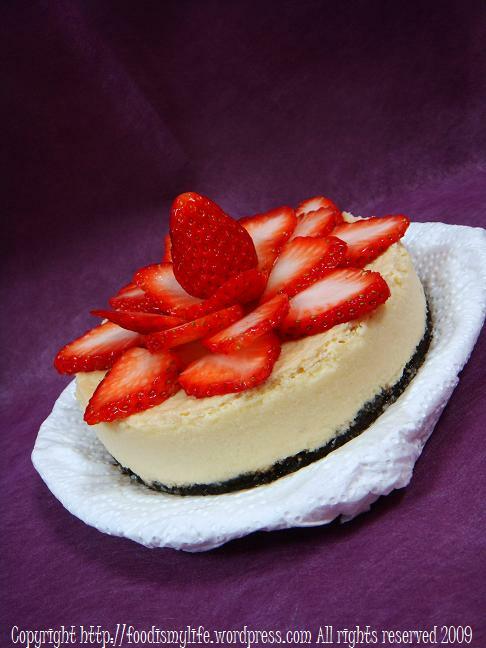 Do you like the creamy, original, London Cheesecake? *or use oreo cookies, without the cream! Using a food processor, process the biscuits until they are like crumbs, then add the butter and pulse again (if you do not have a food processor like me, just place the biscuits in a ziploc bag and then bash away~ with a rolling pin. Transfer the crumbs to a bowl before mixing in the butter with a fork). Line the bottom of a 20-cm Spring-form tin, pressing the biscuits in with your hands or the back of a spoon. Put the tin in the fridge to set while you prepare the cream cheese batter. Preheat the oven to 180 degrees Celsius. Beat the cream cheese gently until smooth, then add the sugar. Beat in the eggs and egg yolks and then finally the vanilla and lemon juice. Put the kettle on. Line the outside of the chilled tin with strong foil so that it covers the bottom and sides in one large piece, and then do the same again and put it into a roasting dish. This will protect the cheesecake from water as it is cooked in its water bath. Pour the cream cheese filling into the chilled biscuit base, and then pour hot water from the recently boiled kettle into the roasting tin around the cheesecake. It should come about halfway up; don’t overfill as it will be difficult to lift up the tin. Put it into the oven and cook for 50 minutes. It should feel set, but not rigidly so: you just need to feel confident that when you pour the sour cream over, it will sit on the surface and not sink in. To make the topping, whisk together the sour cream, sugar and vanilla and pour over the cheesecake. Put it back in the oven for a further 10 minutes. Take the roasting tin out of the oven, then gingerly remove the Spring-form, unwrap it and stand it on a rack to cool. When it’s cooled down completely, put it in the fridge, removing it 20 minutes before eating to take the chill off. Unmould and decorate with sliced strawberries and whole blueberries. To serve, plunge a knife in hot water first, dry it completely before slicing into goodness. 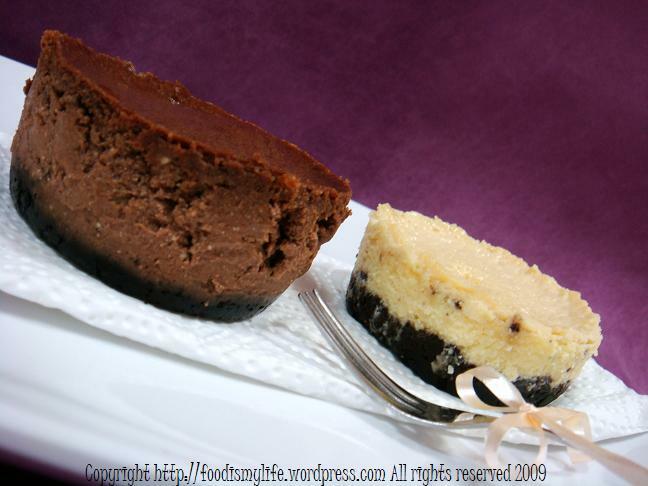 Or do you prefer the luscious Chocolate Cheesecake? *or use oreo cookies, without the cream please! To make the base, using a food processor, process the biscuits to make rough crumbs and then add the butter and cocoa. Process again until it makes damp, clumping crumbs and then tip them into a 23-cm Spring-form tin. Press the biscuit crumbs into the bottom of the tin to make an even base and put it into the freezer while you make the filling. Preheat the oven to 180 degrees Celsius. Put a kettle on to boil. Melt the chocolate either in a microwave or double boiler, and set aside to cool slightly. Beat the cream cheese to soften it, and then add the sugar and custard powder (or vanilla and cornflour), beating again to combine. Beat in the whole eggs and then the yolks, and the sour cream. Finally add the cocoa dissolved in hot water and the melted chocolate and mix to a smooth, yummy batter. Take the Spring-form tin out of the freezer and line the outside of the tin with a good layer of clingfilm (I didn’t dare to wrap it with clingfilm…), and then another layer of strong foil over that (…so I wrapped 3 layers of Aluminum foil instead). This will protect it from the water bath. Sit the Spring-form tin in a roasting pan and pour in the cheesecake filling. Fill the roasting pan with just-boiled water to come halfway up the cake tin, and bake in the oven for 45 minutes to an hour. THe top of the cheesecake should be set, but the underneath should still have a wobble to it. Peel away the foil and clingfilm wrapping and sit the cheesecake in its tin on a rack to cool. Put in the fridge once it’s no longer hot and leave to set, covered with clingfilm, overnight. 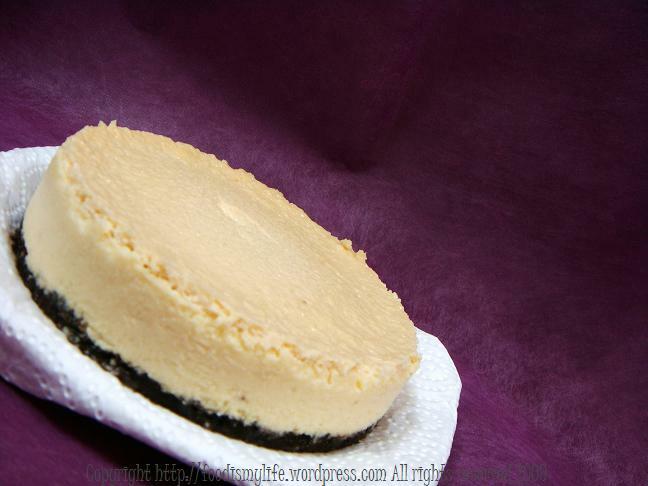 Let it lose it chill before unspringing the cheesecake to serve, around 20 to 30 mintues. Serve with a chocolate glaze (which you can get from Nigella’s website) or just serve with fresh fruits. To slice, plunge a knife in hot water first, dry it completely before slicing into yummyness.